The history of our world's first experience with UFOs remains largely unwritten. 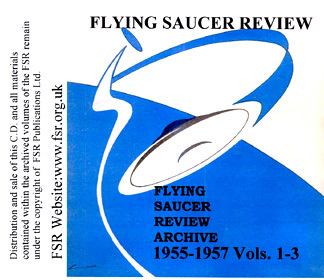 For those who wish to make their own minds up on events that saw "flying saucers" enter the public's consciousness, there is now an opportunity to collect the entire Flying Saucer Review archive. More importantly, you will get a chance to get to know the people of the first flying saucer age, the major contributors who started FSR magazine; they were among the early pioneers of the then new UFO subject. You will get a chance to read the submitted opinions of the early readers in response to this brave journal, FSR, as they pondered the big questions in its letters pages. Classic photographs will be considered in detail for you, the first theories will evolve in front of you, and famous landmark contact cases & reports of UFO landings will be revived to be read again as if they were still today's news. Owning the UFO history contained in these archives is the equivalent of holding many historical UFO first editions in your hands. Most original case reports and first English translations of famous international cases appeared first in FSR. A unique gift from our past, this archive of global reports, historical cases, and quality first hand information represents, in it's narrative, some of the best accounts of the first flying saucer era. From its outset the FSR was a thoughtful and progressive media platform, a leading player ahead of its time. It held a very internationalist perspective when gathering its reports and discussions. It alone has kept us abreast of world developments in UFO cases scattered into the remotest non-English speaking areas of the world. All this while dating back to an era when global communications were far less advanced than they are today. FSR remains a trusted friend to all who want to continue to be challenged by engaging with real news on the UFO subject. Please note the FSR in 1955 produced only 5 issues rather than the usual 6. Bundled with your archived FSR volumes is an optional viewer for the page files-"IrfanView." This simple handy image viewer program can be easily installed on to your computer by clicking the appropriate icon. IrfanView has a zoom option to bring the page into the correct scale to view the pages of FSR. Once the page is held at the correct scale for reading - by clicking the positive or negative zoom buttons -clicking the view panel at the top of the screen will allow you to select the lock magnification option. This will allow you to advance the pages without losing the preferred scale appropriate for your viewing. Clicking the arrow panels at the top of the screen will allow you to rapidly advance the pages of the issue being viewed. Opening each new issue will require you to repeat this sequence of options for re-scaling the size of your image. Please Note: All below prices include Post & Packaging! Click the below Paypal sign for UK Only Orders of £10.00 for the FSR Archive 1955-1957 CD. Click the below Paypal sign for UK Only Orders of £10.00 for the FSR Archive 1958-1960 CD. Click the below Paypal sign for UK Only Orders of £10.00 for the FSR Archive 1961-1963 CD. Click the below Paypal sign for UK Only Orders of £10.00 for the FSR Archive 1964-1966 CD. Click the below Paypal sign for UK Only Orders of £10.00 for the FSR Archive 1967-1969 CD. Click the below Paypal sign for UK Only Orders of £10.00 for the FSR Archive 1970-1972 CD. Click the below Paypal sign for UK Only Orders of £10.00 for the FSR Archive 1973-1975 CD. Click the below Paypal sign for UK Only Orders of £10.00 for the FSR Archive 1976-1979 CD. Click the below Paypal sign for UK Only Orders of £10.00 for the FSR Archive 1979-1983 CD. Click the below Paypal sign for UK Only Orders of £10.00 for the FSR Archive 1983-1986 CD. Click the below Paypal sign for UK Only Orders of £10.00 for the FSR Archive 1985-1991 CD. Click the below Paypal sign for UK Only Orders of £10.00 for the FSR Archive 1992 -1997 CD. Click the below Paypal sign for UK Only Orders of £10.00 for the FSR Archive 1998 -2003 CD.